I took some time and care this morning and upgraded the dp-bj6t35 with a Torin Big Red 8-ton bottle jack. I must say that in the beginning the process is relatively simple as you loosen the screws, the challenge here is the 2 heavy duty springs in the frame railing. The springs already have a fair bit on tension on them just supporting the height of the bottom platen and bottle jack. Once the appropriate screws are loosened to allow you to be ready to begin removing the bottle jack, I would suggest to recruit the assistance of a 2nd person for help in this part. I would suggest someone with a bit of strength. The bottom platen needs to be drawn up basically closing the plates together, in order to place the bottle jack with the collar underneath. It could be done with 4 irwin speed grip clamps (I tried it with one and it just wasn't working, 2 would probably help, but 4 would actually hold the plates up without the need of a second person helping). Once the bottle jack was in place the bottom platen can be lowered with the ram of the bottle jack centered onto the bottom platen (you will see a circular cut-out in the steel here for that). Finally finish by tightening the collar screws so that it is as centered as possible. With this particular bottle jack there were no holes to lock it into the bottom of the frame. It will work fine like this as do in other shop-presses, however, if you do plan on tilting this unit, just be aware that the jack is resting on the frame instead of being bolted on. I would advise to only utilize that method with a bolted on bottle jack (i.e. stock bottle jack). The reduction in plate opening was about 1/2". So it went from having a 1 1/4" opening to 3/4" opening. Not exactly ideal for using 7g stuffed bottle tech filters, but this should be plenty for those pressing rectangle pre-pressed pucks. My personal recommendation is to not pair this bottle jack with the press, mainly due to the limited opening inbetween the plates. If you can live with that, by all means, it fits and works fine. Be sure to take extra special care during the upgrade process, the springs are very tight with quite a bit of resistance. 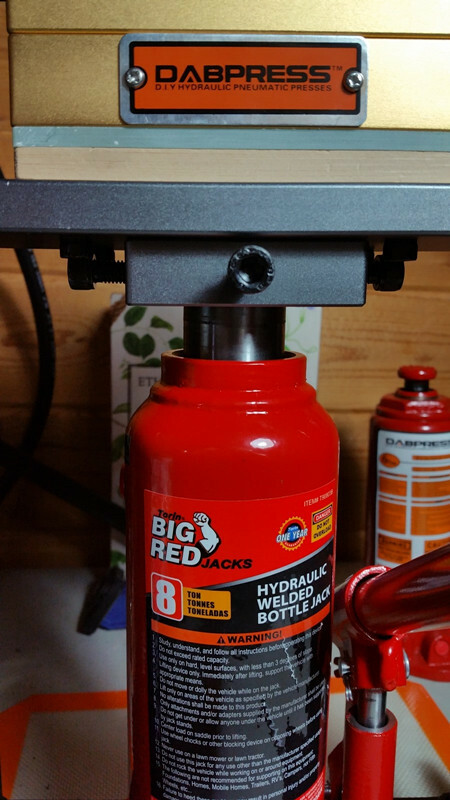 I highly recommend to use the dimensions of the stock bottle jack to compare against any potential upgrade options. Height is probably the biggest consideration, outside of the ram diameter.